CCTV is everywhere and with good reason too. Coventry based JPCCTV provide professional but cost effective CCTV installations within a 70 mile radius. We work on both a domestic and commercial basis and offer the full range of CCTV services. Our business model is to install, service and maintain CCTV equipment, but more importantly it is to make our clients feel secure and in control. 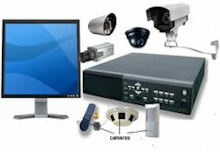 You may simply require the installation of a single CCTV camera? You may require a complex commercial scaled IP CCTV installation? Whatever the scale of your CCTV installation requirements or your CCTV servicing or maintenance needs, JPCCTV will provide you with a professional and reliable service. We have an army of satisfied clients and we actually have some kind enough to leave reviews on our services. They leave these on a separate website and they can be seen by clicking here. Then you truly are in safe hands. Our knowledge and expertise in this industry is vast and we look forward to making you yet another satisfied customer. If you live within our radius and require assistance with CCTV, Burglar Alarms or Access Control installation, please give us a call or visit our contact page and we will be happy to assist you.